Leah is an energetic, dynamic piano teacher in Northern California. When Leah and I spoke on the phone this spring, she was at an exciting point in her teaching career. Leah was working with 50 piano students in two locations (a school and a music store), had a long waiting list, and had decided it was time to hire teachers and find her own location. Leah also planned to add group lessons to round out her lesson options. 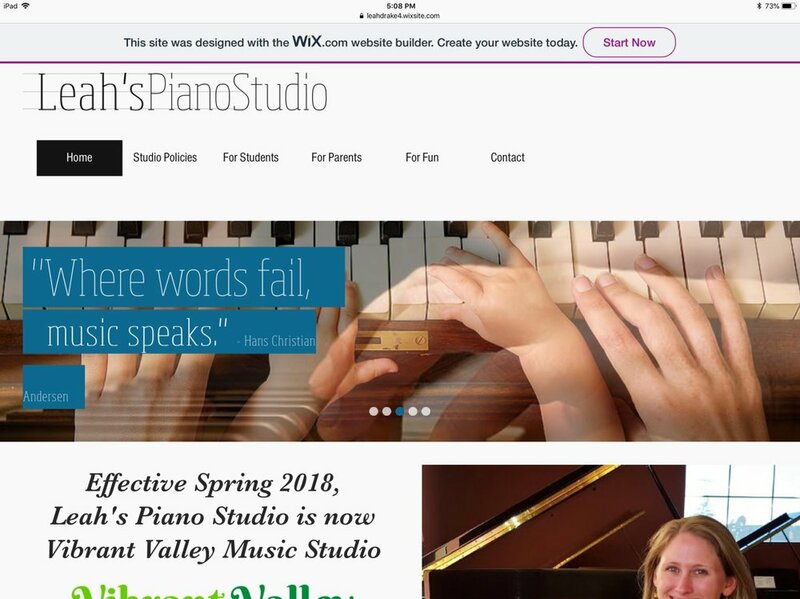 Leah felt that her current Wix website was a “fancy online business card.” Her website and studio name (Leah's Piano Studio) represented a version of her studio that she had outgrown. She was changing her studio name to Vibrant Valley Music Studio to reflect her bigger goals and direction, and Leah wanted a website that supported her studio growth. Leah wanted a website that set her studio apart from others in the area. She wanted for parents to see the balance of creativity, community, and high-quality music education that her studio offered. Leah also needed for her website to function as a place of support for studio parents. She wanted to offer scheduling and lesson payment options through her website, as well as quick access to articles and resources to support her studio families in home practice. Leah’s overarching goal for her website was to gain a powerful tool that allowed her to focus more on her teaching, business, and growth, and less on managing the details. With Leah’s goals in mind, we got to work designing her brand new Vibrant Valley Music Studio website. We started with photos of Leah’s students to showcase the unique energy and community within her studio. We used a color scheme that visually connected Leah’s logo and photos while creating a warm, modern feel. We geared our design toward Leah’s desire for organization and growth. Leah chose to use My Music Staff as her client management software, which easily integrated with her new website. 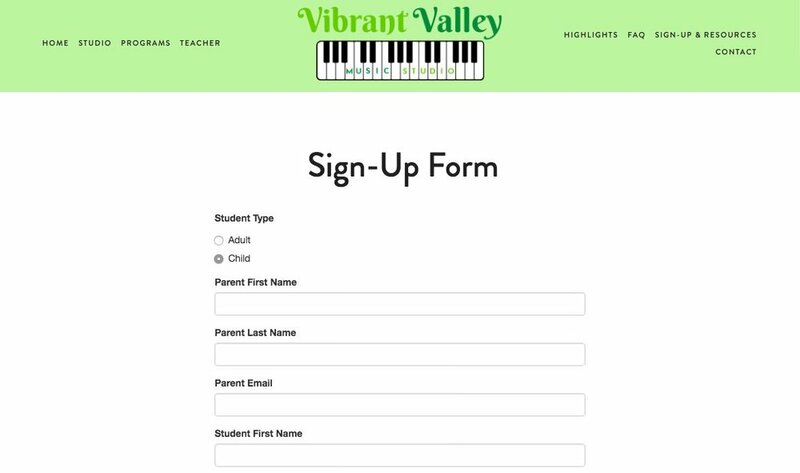 New families would be able to enroll on her website, and studio parents would be able to log in through her website to access scheduling and payment options. We build our websites on Squarespace, so they're easy for teachers to manage and update. Once Leah’s website was built, I gave her a tutorial on how to confidently add and edit content on her new website. When you visit Leah’s website, you’ll see that it’s easy to contact Leah to learn more about her studio. We placed buttons on every page to ensure that parents would be encouraged to request more information or enroll. You’ll also see plenty of white space on Leah's new website. Leah is a highly-organized teacher and requested that her website be clean and easy to navigate. The white space creates a calm, clean feeling and provides a nice contrast to the bright greens. If you read Leah’s bio, you’ll find that it tells the story of her as a teacher. It’s engaging, just the right length, and contains a good balance of professional and personal details about her. Keep an eye on this page; you’ll see Leah add more bios as she hires other teachers. "When I first started teaching about 5 years ago, I designed my own website and it took so much more time than I anticipated. I agonized over fonts, colors, spacing, and my content had to be continually overhauled to increase both its professionalism and relevancy. As my studio grew, I knew it was time for a new website, and Janna made it so much easier to focus on what was really important - the content - and to let Studio Rocket Web Design take care of the rest! I could breathe easy knowing that I would end up with a gorgeous and engaging website that matched my evolving studio. My website now reflects where my studio is as well as where it’s going." We are excited about Leah’s new website and can’t wait to see her growth in the coming months. Is your website due for an overhaul? Have you found inspiration in seeing Leah’s new website? Do you have questions about what it’s like to start from scratch?